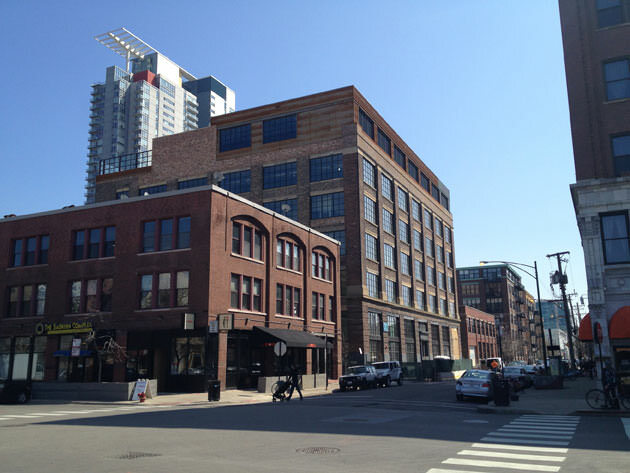 Construction at Soho House Chicago, 113-125 N. Green Street in Fulton Market District, has been completed and is scheduled to open in August 2014. It will be the fourth U.S. location of Soho House, a London-based private members’ club for those in the creative industries. Retained by both the joint venture development team of Shapack Partners and AJ Capital Partners and separately by Soho House, Hartshorne Plunkard Architecture (HPA) was the project architect. HPA also provided interior architecture and documentation services for the interior spaces, working closely with the Soho House design team. Located within the Allis Building, a former industrial warehouse constructed in 1907, the six-story building has undergone a renovation that respects and restores its unique features, including a completely reborn lobby that accentuates the board formed concrete structure. Period details include reclaimed hardwood floors, vintage tile and a lobby wall clad in the wood from the building’s original rooftop water tower. Open to the public will be Pizza East, Chicken Shop and The Allis on the ground floor, and the Cowshed Spa located in the English basement. Amenities available exclusively to members and hotel guests include a 12,000 SF gym with exercise studios and boxing ring, a screening room, and club floor with restaurants, bars and a drawing room. The 40 hotel rooms are daylit by the industrial-sized plate windows, and fitted with custom furniture, Waterworks fittings and fixtures, and luxurious soft goods. The addition of Soho House Chicago as Fulton Market district’s first boutique hotel will broaden the range of existing dining and hospitality offerings, and draw visitors and local residents alike to Fulton Market.